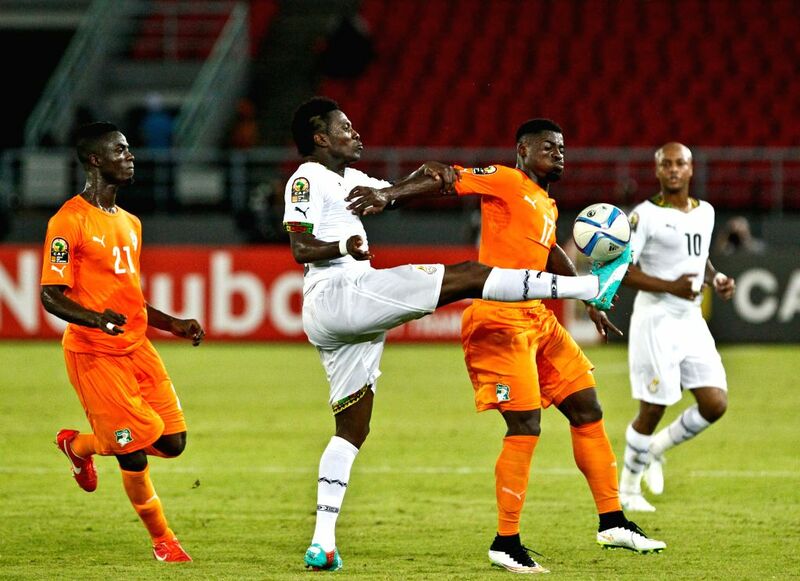 BATA, Feb. 9, 2015 - Serge Alain Stephane Aurier (2nd R) of Cote d'Ivoire vies with Asamoah Gyan (2nd L) of Ghana during the final match of Africa Cup of Nations in Bata, Equatorial Guinea, Feb. 8, 2015. Cote d'Ivoire won the champion after beating Ghana 9-8 in penalty kicks of the final on Sunday. Asamoah Gyan (R) of Ghana vies with Eric Bertrand Bailly of Cote d'Ivoire during the final match of Africa Cup of Nations in Bata, Equatorial Guinea, Feb. 8, 2015.